In the spring of 2018, DigitalHealth.London and the Health Innovation Network brought NHS Trusts together to collaborate and share their work on improving outpatient services using digital tools. 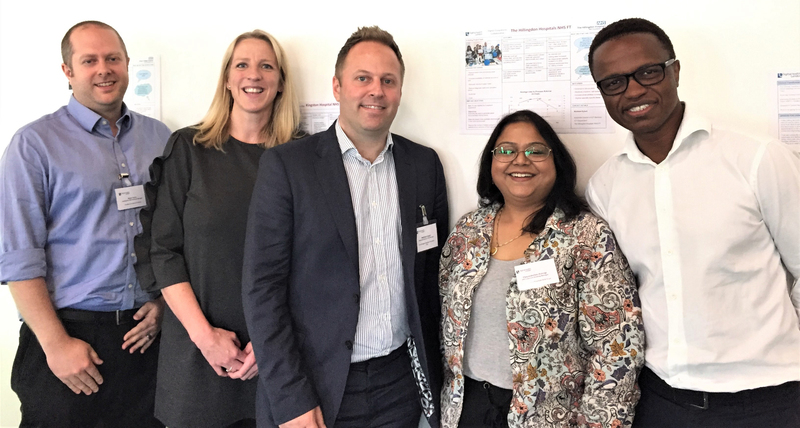 These Trusts took part in London’s first Digital Outpatients Collaborative, which provided insight, events, coaching, and site visits, to help NHS teams share, learn and accelerate their digital projects. The projects the Trusts shared were varied and vital – from virtual consultations in a wide range of specialities, to e-vetting of referrals to new work to reduce DNAs or in some cases, going entirely paperless. The city-wide Collaborative was established by NHS Improvement as a means to support Trusts who are advancing digital outpatients locally. It was open to all London Trusts and invitations were sent out from NHS Improvement’s regional director for London, Steve Russell to all provider CEOs inviting them to send a project team to participate. 16 Trusts responded including acute hospitals, specialist hospitals, mental health and community providers. Around 50 participants from teams in these Trusts, including clinicians, outpatient staff, IT and improvement leads participated enthusiastically in this five-month collaborative which ran from March-June 2018. It included four workshops, with coaching and project support provided to teams over a four-month period. Speakers included subject matter experts such as Bob Klaber, Paediatrician and QI lead Imperial, Shanti Vijayaraghavan, Consultant in Endocrinology and Metabolic Medicine, Barts Healthcare and Toby Garrood, Outpatient Redesign lead and Consultant Rheumatologist, Guy’s and St Thomas’ as well as Steve Russell and Bernard Quinn, Regional Director for London and Director Improvement Programmes, respectively at NHS Improvement. The Collaborative was led by Louise Molloy and Jess Parsons, two project managers with experience in outpatient redesign and digital solutions respectively, from Health Innovation Network. The key results and learning from the Collaboratives feature within this online resource and, even over this short period, the benefits of working collectively to solve common issues across outpatient services become clear. Trusts saw significant savings in time and resource, with health visitors in Greenwich able to gain back an extra hour of their time for every antenatal visit due to reduced travel time from virtual clinics, which meant that many more women were able to receive timely appointments. Having the option of video or phone contact with their Health Visitor is proving really popular with busy working mums-to-be too. Digitally-supported outpatient services also received very positive feedback from staff “surprised how much I like it” and patients: “being in France I couldn’t attend my sessions in the UK so video calling meant I didn’t’ miss any appointments“. Most importantly, faster processes lead to life-changing results: two patients had cancer detected faster through a redesigned and digitally-supported gastroenterology service. On these pages you can browse the learnings from the Collaborative, examples of work from the Trusts who took part and explore the resources they used to help speed up their progress. NHS outpatients appointments have nearly doubled over the last 10 years, rising from 63.2 million in 2006-7, to 118.6 million in 2016-17. Data published in 2017 shows that the NHS in London delivered 22,704,139 outpatient appointments. Every one of these represents an opportunity for innovation. For a more efficient experience for patients and staff. It is a number that is only set to rise. Across England, the number of outpatient appointments has nearly doubled since 2006-07, rising from 63.2 million appointments to 118.6 million in 2017. Patients aged 60 to 79 years accounted for a staggering 29.6 million, more than 30%, of all attendances. The importance of making the best use of this time and resource, through digital health innovation, and improving the patient experience, is unarguable. The NHS remains the biggest user of second class mail in the world, spending over £20 million on postage. The majority of this is sending letters to advise on clinic times. Most of the participating Trusts were digitising outpatient services for two reasons: to speed up processes and care pathways (resulting in a more efficient service) and to improve patient experience. Sometimes Trusts were motivated by a direct saving in costs, such as reduced cost savings for staff through virtual clinics, most often the changes would lead to efficiency savings and services that are better able to cope with demand. While it was not always cited as a reason to start the project, many of the Trusts reported that by improving patient experience and by making processes faster, staff morale also improved considerably. Staff were buoyed by positive feedback and easier processes, which helped sustain the change process. One Trust summed the motivations up as wanting to ensure it delivered ‘the right care, in the right place, at the right time’ with digital outpatients offering far greater choice and control for patients. Learn more about how Trusts introduced new virtual clinics. Learn more about how Trusts are digitising appointment letters, booking services, E-vetting referrals and reducing DNAs. if you’re looking for more inspiration, resources or help to get started, exploring the resources from London’s Collaborative might help. Interested in setting up your own Collaborative in your area? Read more about how we did it here.